Exploring post Peak Oil transport, where oil will someday be too expensive to burn. In my phone conversations with my NY-DMV caseworker, the main problem with my vehicle appears to be the lighting and controls. So, I used an image editor to investigate how some different lighting layouts might work. The FMVSS guide I'm using is HERE . First, about the lighting. Because this vehicle is classified as a motorcycle, it needs to have DOT/SAE motorcycle lights with motorcycle markings in the housing. Finding aftermarket lights has been surprisingly hard since the market is flooded with cheap replacement lighting. Anyway, my first thought on revised headlight placement was to have a single light shine out through the windshield so the light would not affect the aerodynamics. However, using a spotlight, I found that others would only see a glowing blob coming down the road. Since I didn't want to cut into the bubble to mount a light, I eliminated this option. The second option I considered was to take the existing navigator headlights off, then put DOT blinkers in the holes and mount a couple of sealed-beam DOT legal motorcycle headlights on the fenders. Reading the regulations, I found that primary motorcycle lights cannot be more than 8" apart. At first, I was convinced there was some regulation that would exempt a tadpole trike since it would show other drivers that a very wide thing was coming towards them rather than a very skinny thing! However, I found no such exemption. 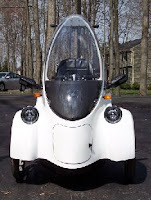 I have since observed that some motor trike vehicles such as the Xebra that clearly would benefit from a wider lighting layout still retain a headlight in the center. Another three wheeled vehicle, the Aptera, does only have two lights on the side more than 8" apart. However, that vehicle is only available in California. So I suspect a special exception was made at the state level rather than the national level. Another configuration I considered was to have the motorcycle light shine out the front door. The headlight, mounted through the removable door panel, would be at the lowest height permitted. One cost of this option is that I would lose use of the front cargo door. The final configuration is to simply place a single sealed-beam DOT approved motorcycle light in the front. I would also like to keep the dual navigator lights on the side since they look nice but they don't need to be DOT grade since the state would consider these ornamental rather than functional. So, I submitted in writing the 2nd and 3rd proposed lighting configurations to my caseworker that shows some proposed configurations and measurements (eg headlight would be so many inches from the ground) and also states electric interlock requirements (eg. motor can't be on without the headlight). Hopefully, my DMV caseworker can point out additional obvious problems. At minimum, I know I need to redo the whole 12V wiring harness for a center light but that was something I was going to do anyway. For now, it's back to the garage for the BugE. As soon as I get my survey back, the work can start on changing out the lighting. In a supreme bit of irony, I learned that Auburn High School completed a roadway legal BugE. Unfortunately, these roadway legal experts were in Auburn Alabama not Auburn NY! History being made. First BugE registered in New York! If you can drive it there, you can drive it anywhere! Turn signals, tail lights and weighing the BugE. One of many who have accepted the fact that there are limits to economic growth.